With our free tool WannaCry-Checker, you immediately check if your PC is safe from WannaCry blackmail software. The blackmail software WannaCry has frightened Windows users since Friday. Wanna Crypt0r 2.0 encrypts infected Windows computers and allegedly only against the payment of a solvency (ransom = ransom) the data again free. However, there is no guarantee, so you should not pay a ransom. Especially owners of older Windows versions can fall victim to Ransomware. For Windows XP, Microsoft has even released its own patch. 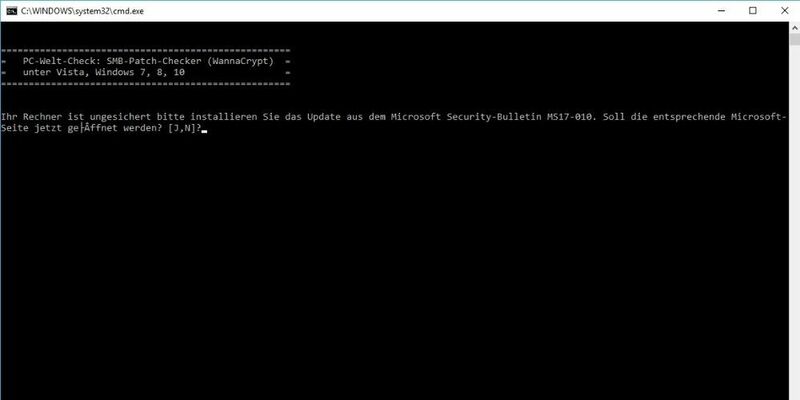 PC-WELT has developed a tool with which you can check whether your Windows computer has installed the essential SMB patch, which protects your Windows from Wanna Crypt0r 2.0. Wanna Crypt0r 2.0 uses an older vulnerability in Windows, for which Microsoft provided a patch (security update MS17-010) in March 2017. Our PC-WELT WannaCry-Checker checks, if the patch is installed and leads it directly to the download page for the patch at Microsoft. Keep your Windows up-to-date and always install Microsoft security updates as soon as possible. The easiest way to do this is by configuring Windows to automatically install new security updates. In addition, you should always have a current virus scanner installed on Windows computers. If you do not want to use a third-party virus scanner, you should at least use the Windows Defender provided by Microsoft with Windows. Linux and macOS users as well as Android users are not threatened by WannaCry.